The great thing about Órgiva is that the town is near lots of stuff: mountains, rivers, beaches and Granada. And if you’re here with kids, there’s plenty to do locally and further afield. There’s a selected events list at the bottom of this page. Someone once told us there were 42 places to have a drink in town, so you won’t go thirsty or hungry. For a morning coffee we recommend Galindo’s next to the church, maybe lunch at El Limonero and dinner at La Almazara, surrounded by orange trees. Opposite Galindo’s you can sometimes buy churros, something many kids seem to believe Spain exists for. Con Jamón Spain think the best places for family meals are El Viejo Molino, La Almazara and Pizza ‘n Love. The Thursday market at the top of town is fun and your child may be able to get their hair braided or buy homemade bangles and jewellery. Have lunch at Baraka and soak up the hippy vibe. The municipal pool is next to the Rio Chico – there’s also a pool at the camping place just out of town on the left towards Lanjarón. You can use the pool if you buy drink and food, which you’ll probably want to do anyway. If you want books, pencils, books and games then Atlántida Librería near the church is good. For cheap paraphernalia, like paddling pools, the Chinese Emporium is where to head. There are chocolate shops (Abuela ili) in both Pampaneira and the nearby spa town of Lanjarón which also has a honey and a water museum. More children’s activities are included in the sections below. Set over 5000 sqm, these lovely gardens are packed full of plants, shrubs and trees. It’s on the outskirts of the town and well worth a visit. You can also enjoy tea and cake. Until the end of August it’s open Wednesdays and Saturdays, 11am to 7pm. (€3 entrance, kids under 12 are free). More here. You can get a bus to Granada from outside Día supermarket to the bus station and then get the Metro into the city. It’s under an hour away and easy to get to by car. One idea is to drive to the car parks at the Alhambra (follow the pink signs on the motorway). Once parked – if you’re not visiting the Alhambra of course – you can walk (or take a mini-bus) down to Plaza Nueva through the beautiful woods. From there just soak up the city. You could go on a tapas tour or seek out the best coffee and sweet things. The science park (closed Mondays) is fantastic as are the multiple historic buildings dotted around the city. Here’s the tourist website. Salobreña is one of the nearest beaches and has several decent places to eat – including Emilio’s and El Peñon. Watch out for the parking restrictions (if there’s a blue line, get a ticket from the machine). Pedalos can be hired. Slightly further on there’s the more interesting Almuñecar which has a great castle and a bird park with meerkats. There’s also the caves at Nerja. There’s Aqua Tropic in Almuñecar and Aquaola just outside Granada (we’re told this is better). There are too many routes to mention but one of Con Jamon Spain’s favourites if the this route through the olive trees. The famous white villages of Pampaneira, Bubíon and Capileira have great walking with good tourist info centres in the first and latter. You can get a bus up there too. La Alpujarra is, of course, famous for its stunning scenery and nothing beats a circular drive from Órgiva to Treveléz, Spain’s highest mainland village. Go either via Pampaneira or south over the bridge via Torvizcon. You could even stop off at a winery along the way – like Finca Cuatro Vientos near Murtas. If you like horses then Caballo Blanco is where to go. Organised rides can be arranged but make sure you have insurance beforehand. 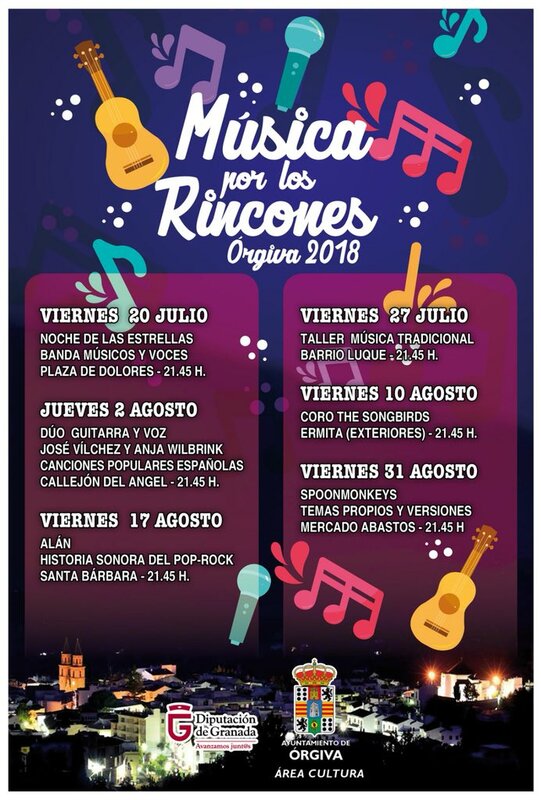 Every Friday (and one Thursday) – Musica por los Rincones. Various musical events including popular Spanish songs on guitar, plus vocal recitals. See poster below. Tuesday 31 July – children’s football tournament in the main square at 6.30pm. It may not be possible to enter a team by then, but may be fun to watch. Monday 6 August to 12 – X Feria de Embrujo de Soportújar – a week of all-things witch-like in the nearby village. Your children may be boiled in a cauldron. Saturday 4 August – the highly-recommended XXV Festival de Cante Flamenco next to the church. 10pm. (Free). See poster below. From 20 to 24 August – Circus workshop for children aged 8 to 12 years. Sports Centre (opposite the post office/Correos). 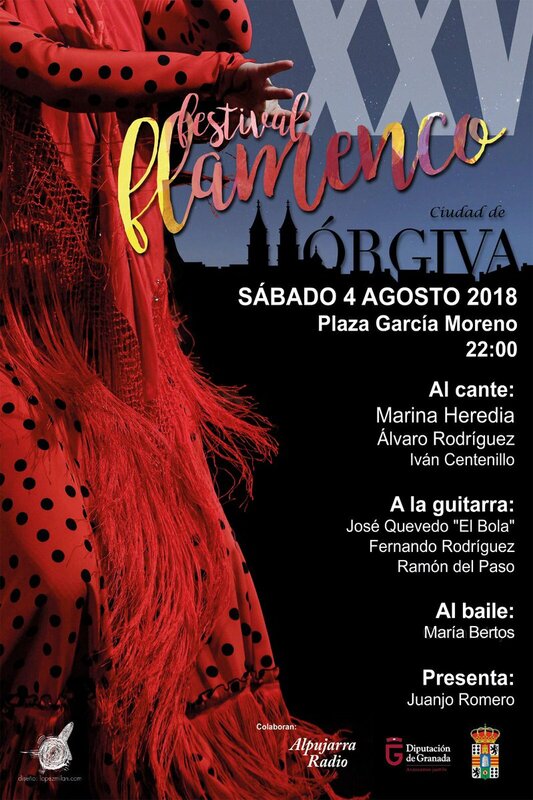 All summer: in Granada there’s an ongoing festival of events in the gardens of the Alhambra; for example, ‘Lorca y Granada‘ – a celebration of music, words and dance. More here. ..and further away still, in Málaga, the city’s fiesta gets underway from Saturday 11 to Sunday 18 August. This guide is offered in good faith. Please check opening times of places. Remember to search this blog for other ideas, or by location – eg ‘Granada’.